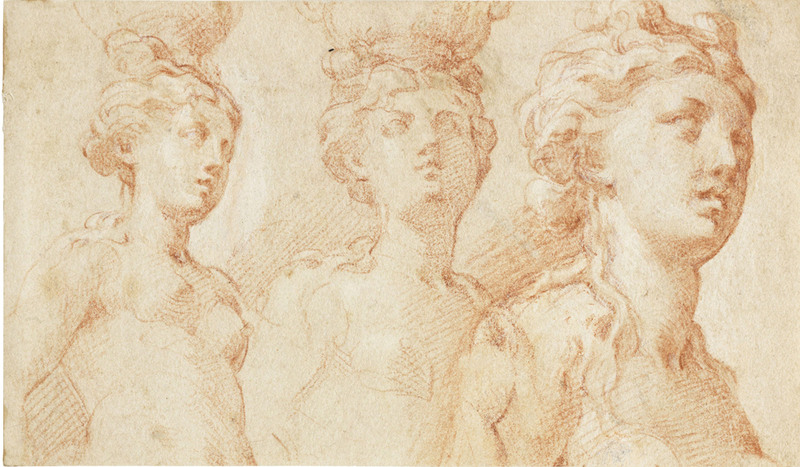 A rediscovered sketch by Italian Renaissance master Parmigianino is to be offered at Bonhams in July. A sketch of three female nudes by Parmigianino. It will be offered at Bonhams on July 5 with an estimate of £15,000-20,000. The study of three female nudes was found among an album of drawings assembled in the 19th century. The 16th century work will be offered at Bonhams' Old Master Paintings sale on July 5 estimated of £15,000-20,000. Girolamo Francesco Maria Mazzola, known as the Parmigianino (meaning the little one from Parma), was a Mannerist painter and printmaker active in Florence, Rome, Bologna and his home town of Parma. This sketch relates to Parmigianino's depiction of the Wise and Foolish Virgins on the vault of the Sanctuary of Santa Maria della Steccata in Parma. However, his commission there was never completed. He was hired in 1531 to paint a section of the interior but he made such slow progress over the next five years that eventually the church authorities lost patience and he was sent to prison briefly for breach of contract. He was banned from resuming work on the frescoes and died shortly after. Despite this short career - he was just 37 when he died in 1540 - he is regarded as one of the most original artists of the Italian Renaissance. He was extraordinarily versatile, producing paintings, frescoes, great numbers of drawings and, towards the end of this life, etchings from his own drawings. The provenance of this sketch can be traced to the late 18th century, it may have originally been in the collection of Francesco Baiardo (1486-1561), who owned many works by Parmigianino and would have bought the sketch direct from the artist. The sketch was acquired in the 1940s by the present owner’s family as part of an album of drawings put together in the 19th century.